People have rated Rumours Entertainment as 5 out of 5 stars! See for yourself what they have to say. I offer a professional disco, with many years experience. So you can relax and enjoy the party without having to worry. The free song request pads give people a chance to ask for the music they want. Just one of the many ways to make a great night. The second year that we have used Mark for our work party and he didn’t disappoint. Even sourced extra music for our quiz and games and played all requests. Helpful and friendly and very professional. Would definitely recommend for any event. Just about everything available to play! 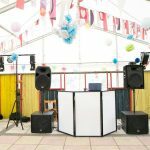 Mark was the DJ at our wedding reception and we were so pleased with our choice! He had people on the dance floor the whole time and read the crowd well with his song choices. His communication before the event was great making sure he knew the kind of music we wanted and seemed to have just about everything available to play! On the night, he was really open to everyone’s requests and was great with the crowd making a lively atmosphere right to the end of the night. Mark has just done our wedding reception 10th november 2018 he was excellent from start to end. We kept in touch all the way from June when we booked him to November. He arrived early and set up. His availability of music was amazing! My family are Yugoslavian so they bought some of their music to play which Mark setup on his system and we danced all night. The night was amazing and Mark was every bit the professional all the way. Thankyou Mark. If you are looking for a great DJ look no further book straight away you will not be disappointed. Mark DJ’d at our wedding in September and he was great! He arrived early to set up and started playing music in the afternoon. We sent him a playlist to give an idea of the type of music, and Mark played songs from that as well as lots of requests on the night! There were a few dancing-induced injuries the following day which I think goes to show how well Mark did!! Mark was the DJ at our wedding last week and was brilliant. He took our play list and also chose some excellent music himself. He kept people dancing and was connecting really well with the guests. Everyone said what a great wedding it was and Mark certainly helped it all along. Mark was brilliant! He kept in close contact with me from the start and always answered my emails straight away. He asked me for a playlist and also gave out pads and pens so people could make requests on the night. He arrived early to set up so that everything started on time. Everyone had a great time at the party and he played just the right sort of music to suit everyone. I couldn’t fault him and would recommend him to anyone! He was absolutely fab – we loved mark.